Arlington, Texas, is a bustling business mecca, and if you’ve spent any amount of time here, then you already know just how many businesses are in the area. Whether you want to launch a company among some of the world’s greatest, or if you just want a coworking Arlington space that’s convenient to transportation, food, and shopping, then look no further. NuvoDesk has a wide range of coworking Arlington spaces available to meet your every need! NuvoDesk is conveniently close to University of Texas at Arlington (UTA), so if you’re a student who needs a nearby working space for launching or growing a company or side hustle, we’ve got plenty of practical options for you. Within range of NuvoDesk are many local hotspots, including the beautiful River Legacy Parks and captivating River Legacy Living Science Center. If you want to work within the range of a beautiful place to take a break, you’ll be right at home at NuvoDesk. We’re also located close to AT&T Stadium, meaning you can leave straight from your coworking Arlington office and go have fun! NuvoDesk is also close to a number of eateries, including fine dining at Restaurant506 and Chamas de Brazil. If you’re interested in something a little more casual and local, then Babe’s Chicken Dinner House, Fork in the Road, David’s Barbeque, and Twisted Root Burger Company also offer plenty of options for the perfect meal. Arlington is a great place to start or grow a business. There are plenty of things to do and see within the area, plus the opportunities for partnerships are monumental. If you’re looking to create a team, then coworking Arlington is immensely promising. Here at NuvoDesk, we are committed to helping you reach your entrepreneurial goals. 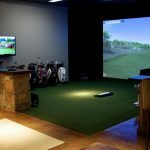 Our facility offers coworking spaces that will make you proud, as well as conference rooms, world-class food options, and even a golf simulator when you need to take a break from work. Our options include weekends-only options all the way up to executive suites. Find out more today!